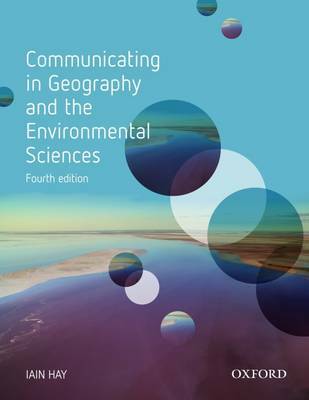 Communicating in Geography and the Environmental Sciences helps students to communicating effectively in academic and professional settings. It discusses the character and practice of some of the most common forms of academic presentation skills used by students of geography and the environment. Chapters outline the ‘whys’ and ‘hows’ of essays, research and laboratory reports, reviews, media releases, summaries, annotated bibliographies, maps, figures, tables, posters, examinations, and talks. Information on the ways in which forms of presentation are commonly assessed enables students to approach their study with confidence as they will have the skills to clearly express their ideas and knowledge. THIS BOOK WILL: Help improve teaching, learning, and assessment. Improves students’ communication skills will help them write better essays and pass exams with confidence. Help increasingly diverse student populations fulfil educational objectives. Revealing the key skills of academic communication and assessment, this text is a perfect study aid to those studying through distance education. Provide students with useful vocational skills. This book develops the key abilities university graduates need to communicate ideas and information as they enter today’s workforce.